This is my third summer canning jams. When I started I honestly didn’t know what I was doing. Canning wasn’t a foreign concept to me though. Mom canned so many tomatoes and beans when I was growing up. She still does. Hopefully next year will be my year to have a bountiful garden, giving me enough produce to preserve for winter. If you are new to canning don’t be intimidated. 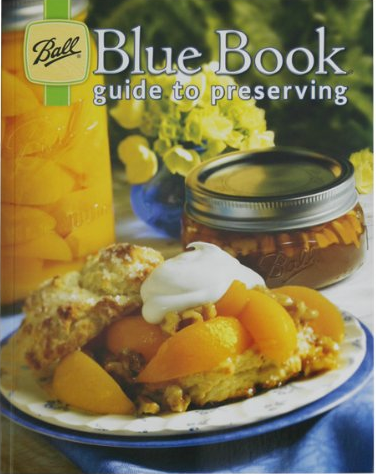 Go pick up a copy of the best known canning book out there: Blue Book Guide to Preserving by Ball. They are the makers of the canning jar so you’d think they would know a thing or two about canning. For someone who was so nervous the first time she started canning I have to say that I love making jams. Like really, really. Canning jam allows me to make some for me and my family to enjoy but it also lets me share with friends. 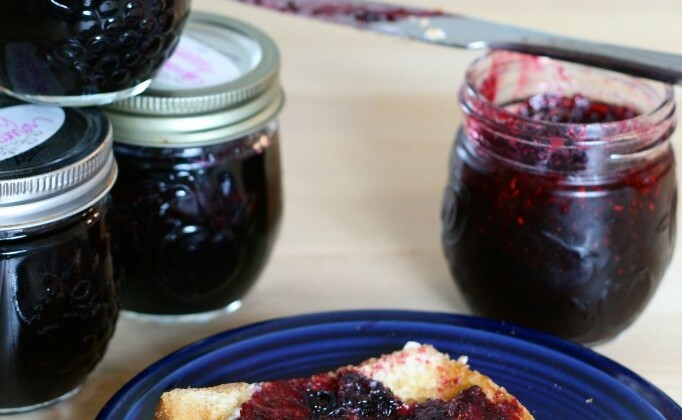 A jar of homemade jam would make a wonderful hostess gift. Last year and the year before I listed canning as one of my food goals for the new year. This year I am coming through. I made this jam last year too but we ate it so quickly I didn’t have any photos to share with you. Blueberry Cinnamon Jam might raise a few eyebrows, especially for the non-adventurous eaters, but trust me on this these two work so well together. There is only a tiny bit of cinnamon in the entire batch. Just a nice background flavor. My daughters went through this so fast last year for school lunches I made a double batch this year and I am contemplating on canning some more this week just in case we finish it before the end of the school year. 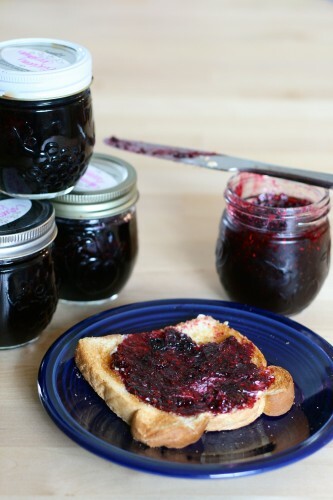 If for some reason your jam doesn't set up correctly you can try to redo it by adding more pectin. Here is a great resource on how to do that: How to Fix Runny Jam or you can just pop in the fridge and use it as a sauce on waffles, pancakes, yogurt, and ice cream. Sanitize all jars and lids before starting the canning process. Crush the blueberries with a potato masher or pulse in the food processor or blender. Run through a food mill if you are opposed to the blueberry skins in your jam. Fill your large canner with water, set on stove, and cover with lid. Bring pot to boil on high heat until ready to use. In a large pot place blueberries, sugar, lemon juice, and cinnamon stir to combine. Over high heat bring the mixture to a boil, stirring constantly. Quickly stir in pectin and cook for 1 minute. Carefully ladle jam into hot half pint jars, leaving 1/4 inch headspace. Wipe off any spilled jam before placing on the lid. Seal the jar with a canning ring until just tightened. Place the filled jars in your canner and lower in to the boiling water. Process for 10 minutes. The higher your altitude the longer it will take to process. Carefully remove the jars with your jar lifter tongs and let them cool in a draft-free area without touching or bumping them for 24 hours. (I usually set them on a bath towel in an out of the way corner of my counter). You might be able to hear the pinging noise of the lids being sucked down and sealed. *music to my ears* If you press down on the cooled lid and it gives that means it didnât seal properly. All jars that are properly sealed can have the rings removed or loosened. Any jars that didnât seal properly can be placed in the fridge and used right away. Oh, I’ve never tried canning before. I really need to have a go. The colour of those blues is incredible! They’re so perfect right now. I bet this would be AMAZING on toast/everything. Yum! High 5 to your bad canning self! You go girl. This jam looks so great. I love that cinnamon touch.. must try this! Yummmm. I use to make lots of jams. Never with cinnamon tho. Sounds intersting to add to blueberries. Do you add cinnamon to other jams too? I’d like to try this with my Saskatoon berries. Yum! I love the name Saskatoon! I hope you love your jam. Yum! would appreciate a nice fresh bread slice with that jam looks divine!